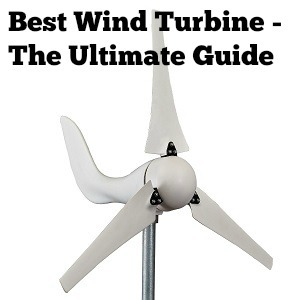 Are you after the best wind turbine reviews? Rejoice, because you have come to the right place! After nearly 70 hours of research/testing and consulting three wind turbine experts, we bring you the largest and most informative wind turbine review article on the internet. 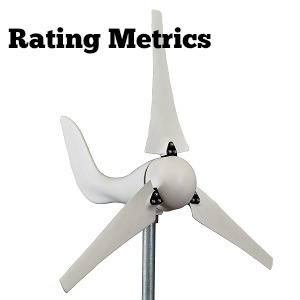 In this review, we list all of the top wind turbine companies and dissect our top picks based off of 5 metrics: Performance, Ease of Use, Build Quality, Price, and Overall Rating. 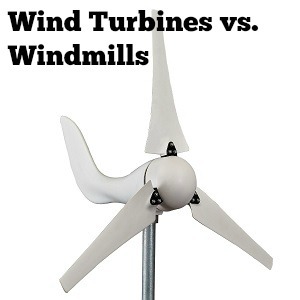 We also help you determine the important factors to look for when shopping for a wind turbine as well as the primary differences between a wind turbine and a windmill. For your convenience, we have listed our top choices in the table below. Hope right below it to have access to all our full wind turbine reviews. 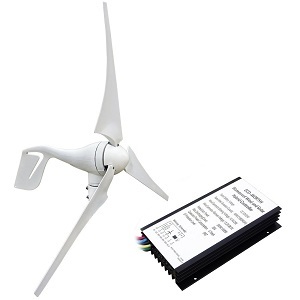 Automaxx Windmill (DB-1200) 1200W 24V 42A Wind Turbine Generator kit. MPPT Charge Controller Included (Amp, Volt & Watt Display) + Automatic and Manual Braking System. DIY Installation. There are quite a few wind turbine brands out there and even more models and trying to sort through them all can be very overwhelming. We have done the dirty work for you and broke down each and every brand. You can see summaries of each below with easy-to-follow links to our full reviews as well. ALEKO is short for Aleko Green Energy, a company that (as the name suggests) deals primarily with finding ways to solve life’s problems in a more environmentally friendly method. In regards to their wind turbines, they have a few different products to choose from in a range of volts starting at 12 volts and going up to 120 volts. They also have a nice choice of power outputs to meet just about everybody’s needs. Prices vary quite a bit but seem to be relatively competitive for a given power output. Despite their name, Automaxx Windmill actually offers a lot of products other than wind-related categories. However, they do stand behind their name and give us a strong lineup of wind turbines to choose from, particularly in the higher-end of power output. Their configuration of choice is the horizontal 3-blade setup and you will enjoy up to a posted theoretical power output of 1,500W. Asking prices are also reasonable considering what you are getting as well as the quality behind it. BestEquip sells a diverse range of products on various online marketplaces and seems to have an approach of being a “jack of all trades” as opposed to mastering a specific one. Indicative of this, the BestEquip wind turbine lineup is quite limited, with their offerings being just a single 400W model. If we had to choose just one model to sell, a 400W is a good choice as it is neither too small or too large and can cover a lot of applications. Asking prices are reasonable as well although, for many other brands that take this approach, we typically see them trying to compete on the lower-end of the market. Eco-Worthy is another brand that makes it living dealing with eco-friendly products. While they seem to primarily focus on solar power, they also have a few different sizes and configurations of wind turbines as well as some rather unique hybrid systems that combine wind turbines with solar panels. Overall power output, while diverse, still seems to hover around the mid-range mark. Also, asking prices can be somewhat high both due to the more complex hybrid systems used as well as the respected reputation of Eco-Worthy. Gowe is another popular brand that sells a very nice range of wind turbines, from small entry-level products all the way up to units that are designed to power entire houses or buildings. They also offer up various hybrid and vertical systems. That being said, it appears that many of their models are discontinued so not only may you have difficulty finding a specific model but things such as replacement parts, customer support, etc., might be more challenging. However, due to the number of products that they produced, there are a lot of these units floating around so finding 3rd party assistance is quite doable. Asking prices vary quite a bit but tend to lean towards the premium side of things. 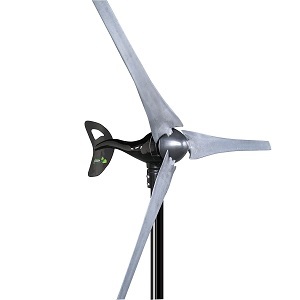 GudCraft sells the Aleko line of wind turbines which we have reviewed above. The names GudCraft and Aleko are commonly interchanged but are the same product. Hukoer is another brand that sells just about every type of product you can think of online. While we see this quite often, we were surprised in just how large of a lineup of wind turbines Hukoer offered despite not really being a “wind turbine company”. That being said, most of their models tend towards the smaller side of things and are very straightforward and simple in their design. This results in very reasonable asking prices. Mophorn is another player in the relatively low-cost and simple wind turbine market. They focus mostly on a variety of appliances and tools (mostly in relation to home improvement) but do have a small wind turbine lineup. Their examples are on the lower end, ranging from 300 to 400 watts of potential power, and utilize a very straightforward and simple approach that allows them to achieve their competitive price point. NAIER is a company that we weren’t initially familiar with but have since come to find out that they offer a few smaller-caliber wind turbines that are sold mostly online. 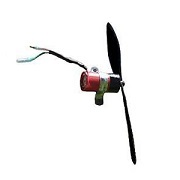 Their max power output ranges from 100W up to 700W and they offer both horizontal as well as vertical wind turbines. Some of their products also come included with an external inverter that helps to manage fluctuations in power production better. Asking prices are surprisingly quite high. Nature Power sells various eco-friendly products centered around solar and wind power. In regards to their wind turbines, Nature Power sells a 400 watt and a 2,000-watt unit. This is a very limited selection, although the 2,000 watt is one of the highest power output in the industry. The design and layout of the turbines are certainly unique and will stand out from the crowd but they do come in at a rather high asking price. Pacific Sky Power is a truly unique company in that their wind turbines are designed for DIYers and they are also much smaller and more affordable than most of the other products out there. 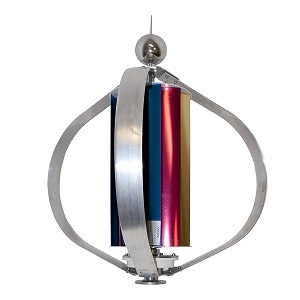 These tiny turbines are extremely mobile and modular and can be strung up in a series for an added effect. Rather than power large appliances or homes, they are intended to power single small devices, making them great for the beach, camping trips, etc. Primus Wind Power is one of the most experienced and respected players in the non-commercial wind energy game and for good reason. They offer up a small but varied selection of wind turbines, ranging from their small Air Silent X and Air 30 turbines up to their Air 40 and Air Breeze turbines. One of their main focuses seems to be on marine-related turbines that are designed for sailors on boats or near the shore. They pride themselves on high-efficiency products that are also reliable but they do come at an above-average asking price. Sunforce is similar to several other companies we have reviewed here in that their main focus is on solar power (if their name didn’t already give that away). 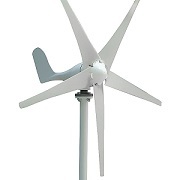 However, they do offer a single wind turbine that is on the smaller side at 400-watts in their 44444 model. Sunforce hopes that the combination of their established reputation in the solar industry, as well as the lightweight attribute and simplicity of their wind turbine, will convert into a winner. TOPQSC is one of the many brands in the online world that seem to import a wide variety of products and sell them to popular online retailers. Their approach revolves around simplicity and low asking prices rather than creating a niche brand or trying to be cutting edge in regards to performance or quality. They offer one wind turbine that is very affordable but does have to take some shortcuts in regards to construction and overall performance in order to achieve their competitive price point. TOYOSO imports various items, focusing mostly on the tools, automotive, outdoors, and kitchen categories. Despite their rather diverse lineup, they do have a larger than average selection of wind turbines in both horizontal and vertical configurations. That being said, all of their models tend to the budget side of things and, as expected, are also quite low in total power output. Tumo-Int primarily focuses on 4 products: a wind turbine, a sine wave power inverter, a lead battery, and a GEL battery. Their turbine lineup is quite small, being only two units. However, the 2 Tumo-Int wind turbine models are extremely powerful and among one of the highest-performing you will find on the market. They also come with the ability to swap between 3 blades and 5 blades which add a helpful level of customization. However, this great performance comes at a rather high asking price. Vogvigo has a somewhat strange name but one thing is for certain: they sell a ton of different products that span just about every category you could think of. Despite being involved in all sorts of product lines, their lineup of wind turbines is quite large. Their model and setup of choice seem to be horizontal orientation with either 3 or 5 blades but their power range is relatively diverse, starting at 100W and going up to 700W in both 12V and 24V formats. Asking prices are very competitive for their given power output. There are various considerations that have to be made when searching for the best wind turbine for your needs. To make things easier, we have broken down the most important metrics. We go into detail about each one below. Probably the most advertised metric, performance focuses on the level of power that a particular wind turbine can put out. That being said, it isn’t just as simple as “a higher power output equals a higher rating”. Things such as efficiency in converting the wind into usable energy, being able to produce adequate levels of power at varying wind speeds (particularly at low wind speeds), the design and size of the turbine blades, and much more go into this metric. Typically there is a rough correlation between higher power output and higher asking price so we give extra points to those models that are able to stand out in the power to dollar ratio. 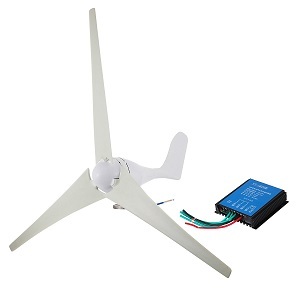 We like wind turbines that are not only simple to set up but also easy to operate. Some wind turbines require constant maintenance and tweaking after installation while others are essentially “set and forget”. We particularly value examples that come with everything that you need to set it up as well as informative installation manuals. One of the common complaints with wind turbines is that they require you to source out and fit a proper mount and brackets. The brands that have spent the extra time and effort to find the essential parts and include them are a huge bonus in our book. Build quality refers to the ability of the wind turbine to hold up to typical wear and tear as well as Mother Nature which it will obviously be constantly exposed to. We have found that manufacturer’s warranties vary quite a bit on wind turbines and the difference between a one-year warranty and a five-year warranty not only greatly affects our peace of mind but also speaks loads for the confidence in the manufacturer when it comes to the build quality of their wind turbine. We like seeing premium materials being used where possible as well: metals and carbon fiber over cheap plastics. The internal moving mechanisms need to also be of high quality as the deterioration of these can cause catastrophic damage to the unit. Price is always an important metric no matter what type of product you are reviewing. As we have mentioned in all of other huge extensive reviews, simply being cheaper doesn’t automatically mean it is better. We look for diamonds in the rough in terms of value related to performance and build quality. A more expensive unit that blows its competition out of the water may easily score more points than a budget unit that has loads of quality and performance issues. This rating combines all of the factors discussed above into an overall rating. It isn’t always an average of the other values but rather we try to capture the “big picture” of how good or bad a particular wind turbine is. If a turbine absolutely excels in one area it may more than make up for lacking in another, and the opposite can be the case as well. A rough rule of thumb is that anything scoring 3.5 stars or higher is a recommendation in our book while examples scoring 4.5 and above are great choices. These are the full reviews for all of the wind turbines we have reviewed. We go into great detail about how well each fare in the metrics outlined above. We also give a specific rating to each metric as well as list out all of the available models. Due to the rather large range of power choices, performance will vary quite a bit depending on which model you go with. On the lower end, you have small 10 and 15-watt vertical wind turbines that won’t be able to power much. This slowly increases incrementally up to the much more impressive 3,000W 72-volt WG3000 model. As for actual power output, we have seen that the power produced is pretty representative of what Aleko posted as long as you have a strong wind. Anything under 5 to 8 mph and you won’t see much power produced, particularly in the larger models. While this is a concern with any wind turbine, it seems to be a bit more pronounced here. We do like the nice range of voltages to choose from, however, as it hits a much wider target audience. And the inclusion of vertical wind turbines is a great addition as well. These turbines are a breeze to assemble and setup. There are a few additional pieces that you may need that don’t come with the packaging so be sure to read the instruction manual carefully. The controller it comes with is very simple to use and understand. Really the only challenge is finding a location that has a nice steady wind in order to tap into Aleko wind turbine’s full potential. Also, keep in mind that there is a recommended 100-hour break in period on most units. We have experience and seen a few complaints in regards to build quality. The shell is made of high-quality precision steel and the blades are made of reinforced fiber glass that is plenty tough. There have been a few issues with the generator burning out after only a few months but these issues are so few and far between that we don’t consider it a major issue. 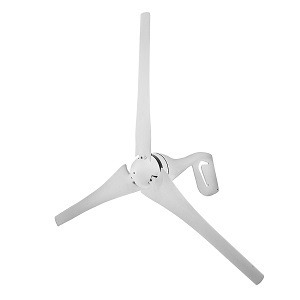 Aleko wind turbines are protected by a 1-year limited warranty. Asking prices are actually quite competitive when compared to other comparable units on the market. Obviously, you will expect to pay a decent sum for one of the larger units but this is to be expected with any turbine that produces 500 watts or more of power. And, for the price, you get a tried and tested unit that is quite durable. 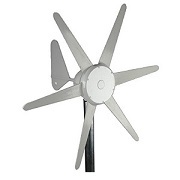 Aleko offers up one of the more diverse ranges of wind turbine selections on the market, starting from entry level horizontal and vertical turbines all the way up to huge 1,000 watts+ models. For the most part, you can expect to enjoy these levels of power assuming you have a strong headwind. For those that have greatly varying or inconsistent wind, you may want to go with something more sensitive but also weaker. Build quality and user-friendliness and also more than acceptable. 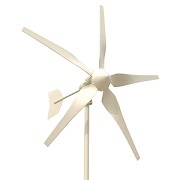 Aleko wind turbines are a solid and proven choice. We do like that Automaxx Windmill wind turbines hit such a wide range of power production. On the lower end, you have their relatively portable DB-400 which is capable of up to 400W of power in 12V. For those after something with more punch, you can go with the 1,200W or even 1,500W models in 24V. To achieve these maximum power ratings you will need a little of 30 mph wind gusts which are about average efficiency from what we have come across. On the lower end, power production begins at 4.5 mph which is also about the industry average. Blade length is plenty long, with a rotating circumference of nearly 15 feet. These are all-in-one kits that provide just about everything you would need to get up and running. The only thing missing is the post that you will put between the base and the turbine itself and its length and specifications will be up to the individual. We recommend getting something that is at least 30 feet tall to take advantage of higher headwinds. The material used is quite lightweight, being made of high-quality polypropylene and glass fiber material. This means it is easy to handle and assemble but it is important to properly mount it so that strong gusts don’t topple it over. Build quality is more than acceptable. Both the plastic pieces as well as the internal moving mechanisms are up to good quality standards. 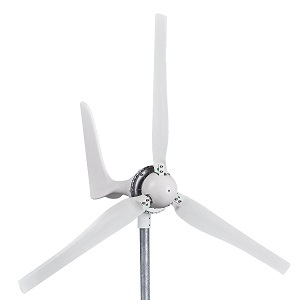 Windmill stands behind its product with a 1-year manufacturer’s warranty. We do wish that they would have gone with a bit more of a resilient material for the turbine blades such as carbon fiber but the glass fiber (similar to fiberglass) should hold up for at least a few years of standard wear and tear. The asking price, while not the cheapest, is at a good level given the quality that you will enjoy. Windmill has quite a bit of experience when it comes to wind turbines so we feel that there is a slight upcharge because of their reputation. However, the real shining point here is the great combination of acceptable performance, effective efficiency, and quality parts. 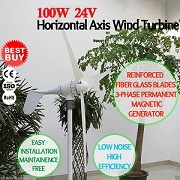 Automaxx Windmill wind turbines take a very straightforward approach with their 3-blade setups and are able to hit a pretty large target audience despite having a relatively limited lineup. Their large blades are able to convert nice levels of wind into usable energy (particularly in their larger models) and nice average power output can be achieved with moderate wind speeds that can be found in many places. While you won’t’ find anything groundbreaking or be wowed by exotic materials, the durability is there and you should not have to worry about any glaring quality issues for quite some time. Red flags sometimes pop up in our head anytime we are dealing with a company that appears to import a vast majority of their products. While there is nothing wrong with importing, this typically results in products that are very reasonably priced but can struggle both in performance and build quality. We were surprised to find out that the performance here is actually not bad at all. Just keep in mind that to achieve anywhere near with advertised 400W output, you will need a rather high wind speed of over 26 mph. This is because the blades are not overly large on this model and we also assume that the generator is not as high of quality as some of the more expensive and efficient units on the market. This is simply the price you pay for a competitive asking price and people in windy areas shouldn’t have to worry about it either way. Assembly is easy and everything you need should come in the package. The 12V controller that is included is simple and effective and the screws and nuts you need are easily labeled. The unit is also quite lightweight thanks to avoiding using a lot of heavy metal components like we have seen in other brands. This can obviously affect durability but the weight savings are significant. Build quality is about what you would expect given the price. The parts are made of either lightweight metals or plastic and are of good craftsmanship but are a bit on the thin side. As we discussed above, this is great for weight savings but you may not be as confident about leaving a BestEquip wind turbine outside in the middle of a strong storm. However, for all other scenarios, it should hold up to typical wear and tear just fine. You also won’t enjoy the longer and more encompassing warranty that brands that focus more heavily towards wind turbines can offer. Asking prices are very competitive and your watt per power ratio is quite good. For a model that can actually achieve close to this figure at high wind speeds, this is a welcome surprise. There are obviously some sacrifices that have to be made in terms of features and durability but they aren’t major enough to be of huge concern. BestEquip wind turbines consist of a single unit and it is trying to compete in the entry to the mid-level bracket and focuses on those that are wanting a wind turbine but are on a rather tight budget. If you live in a very windy area, the bang for the buck here is great. But for those after more significant power outputs or have to work with less wind, a more sensitive (and expensive) product from another brand may be your only choice. In regards to sheer power capabilities, you are looking at wind turbines that range from 400W up to 1,480W. While these numbers are pretty standard compared to what else is on the market, the way that they are achieved are anything but standard. Most Eco-Worthy wind turbines take advantage of a hybrid system where they combine both wind power and solar power. This honestly isn’t a huge surprise, however, as Eco-Worthy focuses on solar panels primarily. There are pros and cons to this approach. The major benefit is that you have two potential sources of power: wind and solar. As expected, the potential power produced by the wind turbine exceeds that of the solar panels but we have seen the solar is much more consistent in power product, especially if you live in an area that receives a lot of sun. The con is that the wind turbines used are average at best and require quite a bit of wind to really get going. So you will need both a sunny day and a windy day to realize anywhere near the maximum rated power of a system. There is a bit more initial setup and calibration for this compared to a standard wind turbine system. Eco-Worthy wind turbines will require you to not only find a suitable place to mount your turbine but also a good location to put your solar panels. You then have to properly wire them back to the main controllers. This is important to realize as most people will tend to put solar panels on their roof or another elevated area while often times simply putting their turbine on a tall post in the middle of a field. If you want to do something like this, be prepared to run some pretty long wires. The solar panel build quality here is excellent as is the case for most of Eco-Worthy’s solar panels. However, this review is focused more on wind turbines. They aren’t terrible but are by no means industry –leading. There have been a few reports of the generator giving out after just a few months and overall we have seen many more complaints about the turbine side of things than the solar panels. Part of us wonders if Eco-Worthy simply jumped into the wind turbine business without fully grasping what is necessary and rather just wanted another way to show off their great solar panels. As we alluded to above, the asking prices here given the total power output is quite high. Yes, you will likely enjoy a more consistent power output depending on where you live but whether or not that is worth the premium upcharge will be up to you. 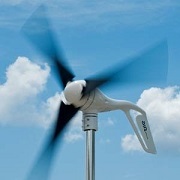 Eco-Worthy wind turbines take a very refreshing approach that makes them stand out from their competition. By combining wind turbines with solar panels, they appeal to a unique audience and their products offer specific benefits that a standard wind turbine simply can’t match. However, those situations are very site-specific and many may not be able to reap the benefits and simply be forced to pay the higher price tag. If you live in a very windy and sunny area then Eco-Worthy wind turbines are worth checking out. For everyone else, you will likely rather save some money and go with something more conventional. Overall, performance is pretty good across all of Gowe’s wind turbines. The blades that are used typically are quite large and lightweight and can start to produce power at relatively low wind speeds and are quite efficient at producing impressive power at higher gusts. For those with less wind but more sun, they also offer hybrid units that combine solar panels with turbines and they also offer vertical wind turbines for those after that specific configuration. Probably one of the things that we are most impressed with is just how wide of a range of Gowe wind turbines there really are. You can go with a standard 400W unit or tier up to a powerful 3,000W unit (assuming you have the wind speed to power it). Most of Gowe’s products are very simple to use once properly installed. The challenging part can be the installation. We have noticed that a lot of their units are rather bulky so not only does that add to the challenge of transporting and storing them but also in finding a suitable place to mount them. In addition, the hybrid systems add an additional level of required tweaking in order to properly perform. Finally, the fact that a lot of these products appear to no longer be supported or carried by Gowe means that any questions that you have with installation or operation will be more challenging to have answered. Build quality is acceptable. Gowe wind turbines seem to utilize more plastic than a lot of other turbines in this price range. This makes them more lightweight but also makes them less capable of handling the occasional bump or collision. That being said, you also don’t have to worry as much about potential corrosion (though for these level of wind turbines that typically shouldn’t be a major concern either). The inner moving parts are of good quality and should last for several years of typical wear and tear. Gowe wind turbines certainly aren’t the cheapest you will find. For a given power output, we have found that asking prices tend to be on the higher end of things. Combine this with the fact that any spare parts of maintenance that you need will likely require going to a third party means that operating and using one of these units can be pricey. Gowe wind turbines really wow us in just how many there are to choose from and the wide range of shapes and configurations that they have. No matter if you are after a standard wind turbine, a hybrid system, or even a vertical turbine, they likely have a product for you in various power outputs. Build quality is also acceptable. The major issues we have is with the higher than average setup, high asking price, and the fact that Gowe seems to have dissolved a lot of their wind turbine lineup which makes support more of a challenge. We are a bit underwhelmed by the performance here. Not only are the units not overly powerful in their posted ratings (the highest being 1,000W with a vast majority being closer to 500W), but we have found that achieving those numbers requires very high wind and essentially “perfect” conditions. While this is the norm for most wind turbines, it seems that the efficiency levels just aren’t up to par here. Because of this, you may be underwhelmed with the power levels you achieve and have to utilize additional turbines or find other sources of energy to fill the void. 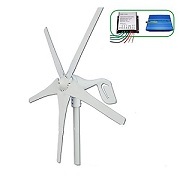 Hukoer wind turbines are very simple to use and set up. We assume that Hukoer is simply importing these units from a manufacturer and they were likely made with the intention of being simple and user-friendly. Not have a ton of complex gadgets and mechanisms also make them easier to set up and understand. Being on the lighter and smaller side, they are also very easy to transport and don’t take up nearly as much space as you might think. The build quality here is about average. When looking and holding a Hukoer wind turbine you can instantly tell that it isn’t on the premium level as some of the much more expensive units we have reviewed. Rather, it is a simple and low-cost unit that is good for people just starting out in the wind turbine world. As mentioned above, the simplicity also plays a role in lengthening life expectancy since there are fewer parts that can break. Hukoer’s best selling point is likely in their attractive price points. Compared to other comparable wind turbines on the market, Hukoer wind turbines are among the most affordable. This is good for those on a tight budget but it is important to go in understanding that with the lower costs there are some sacrifices in performance and features. Hukoer wind turbines stick to the company’s apparent method of doing things where they offer up low-price imported products that don’t have a ton of features but are simple. The performance here is somewhat lackluster but for such a competitive price you can’t be overly picky. A decent choice for someone after a smaller wind turbine but those with more grand plans will need to shop elsewhere. The achievable performance is a bit on the low said at only up to 400W. And it is important to remember that the 400W is only achievable at wind speed nearing 24 mph. That being said, this peak wind speed is a bit lower than some of the other examples we have come across (many approach 30 mph per more). This is thanks to the lightweight construction and surprisingly long blade length given the small stature of Mophorn wind turbines. That being said, for those looking for a more powerful solution you will be out of luck with this brand. A great benefit of the lightweight and small construction is that the unit is very compact and easy for just about anybody to set up with some normal tools. 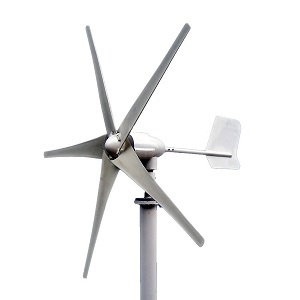 You don’t have to worry about struggling with bulky parts or huge rods with this wind turbine. The operation is also a breeze and essentially is plug and play. The biggest place that we are reminded that a wind turbine is in the budget category is with its build quality. You will find a lot of plastic and lower-quality metals with these units than you will with higher-end models. That being said, the blades themselves are made of carbon fiber which is quite nice and should last for a long time without issue. The generator and electrical components are also of acceptable quality. There have been some complaints about wind turbines arriving and being dead but Mophorn is apparently good are responding and replacing parts as necessary. We are really impressed with the great asking price here. Yes, the power output is a bit on the low side but even then it is nice to be able to pick up a proper and true wind turbine for a relatively minimal impact on your pocketbook. It is just important to go in understanding that for these asking prices you aren’t going to get something that will be able to power a significant amount of items at one time. Mophorn wind turbines are simple and cost-effective but do lack in the performance department. They are very simple to set up and use and build quality, while not class-leading, is acceptable enough for most. A good choice for someone on a tight budget but who wants to play around with wind turbines but they are by no means an end-all solution for a larger application. Overall performance for NAIER wind turbines is about average. The posted power production tends to be on the smaller side with no units being able to produce anywhere near 4-digit wattage. That being said, the blades and generators used are quite lightweight and get up and going to produce power at lower than average wind speeds. This is helpful for those in areas that don’t have a lot of high wind gusts to work with. We also like that there are products that have more than 3 blades as well as some uniquely shaped vertical turbines. But for those after more significant power you may be a bit underwhelmed. Assembly is very simple and the inverter included with many of their turbine kits helps to make the whole process as user-friendly as possible. NAIER also proudly exclaims that their wind turbines are “maintenance free” but it would take a couple of years of regular use to really test this proclamation. 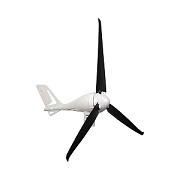 The wind wheel blades are made of fiberglass but the rest of the unit is made of relatively thin plastic material. This, of course, is able to withstand potential rust but it doesn’t feel as sturdy as some of the metal-based competitors on the market. This may not be an issue early on but we would be curious to see how well that base can hold up after a year or two of weather and wind pushing against it. However, the maintenance-free exclamation also shows us that NAIER is confident of their build quality. The asking prices, given the posted power output, are extremely high. We aren’t really sure why they are so expensive. Of course, including a power inverter in the kit justifies a higher price tag since they can be quite expensive but even the wind turbines that don’t come with inverters are very pricey compared to comparable units on the market. 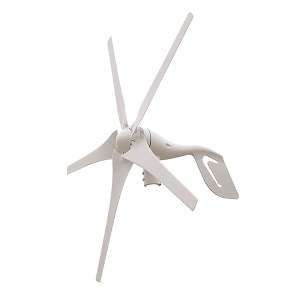 NAIER wind turbines offer up a simple selection of lower-power wind turbines in both horizontal and vertical formats. They also happen to include inverters in some of their packages as well. While we do like the low initial wind requirements to get the turbine spinning, the lack of higher-end units, as well as the very high price tag, is major turn-offs for us. We are impressed with the high posted power output in the 2,000 watts 70701 model but it does require extremely high wind speeds to achieve it (45 mph). In addition, at lower wind speeds, both units struggle to rotate much which means you will not enjoy much power production. This is surprising to as the blades are made of lightweight carbon fiber and are quite large. We must assume that has to do with the internal mechanisms and them having a higher friction rate than a lot of the competition out there. In other words, unless you live in an extremely windy area you won’t see anywhere near the posted power output and in fact, may have to struggle with very low power production. The unit is simple enough to set up but it does come with some issues. The high wind requirement was already mentioned above but there are also issues with the battery array being lackluster and there is also a very high break-in period where you have to closely monitor the conditions and wind speed it is exposed to. All this combines for a much more laborious wind turbine than what we are used to. We will admit that the fit and finish of Nature Power wind turbines is excellent. The design gives off a feeling of quality. Unfortunately, that is where the good ends and the bad begins. The blades have had multiple reports of coming in with rough spots which not only affect performance but can also increase vibrations and ultimately damage other parts of the wind turbine. In addition, the charge controls are very flimsy and break easily. Finally, dealing with customer service and getting replacement parts is very challenging and can take long periods of time. All in all a very frustrating experience. These units are certainly not cheap, particularly in the 2,000-watt model. You will find many examples of units on the market with similar posted power production that are much more affordable. This, combined with the issues mentioned above, makes it seem like you are paying more than you should. Nature Power wind turbines stand out due to their modern design and the high power output of the 70701 model is nice but the underlying issues are simply too much to ignore. Extremely high wind speed requirements, quality issues, and a very high asking price combine to make these units a questionable purchase. We recommend saving your money and shopping around. Due to the small size of the blades and the generator, Pacific Sky Power wind turbines can only produce a maximum of 15 watts. This is only enough power to power small devices such as LED lights, cell phones, etc. That being said, for the size, this is actually quite good. And for those after more power, you can hook these up in rows for added effect. 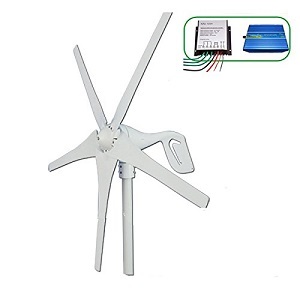 Obviously, you won’t ever achieve the power production of a larger professional-grade wind turbine but with these, you have much more adjustability and versatility with how you use it. These units are extremely easy to use thanks to their small size and weight. You can easily carry them anywhere you go and temporarily set them up on any flat surface. You can even clamp or mount them to the side of a tree or building if necessary. This is much different than most turbines we have come across that require a static and reinforced mounting mechanism that forces it to stay in one place. Their small stature also makes simple adjustments a breeze (pun intended). There really isn’t much to these products which is a good thing in that there aren’t many things that can break but you also won’t get the thick reinforced body that some of the larger turbines have. Things such as water as well as bumps and scrapes can impact one of these much more than a typical larger unit. However, the generator is of good quality and we haven’t heard any major complaints about them breaking prematurely. Pacific Sky Power wind turbines are extremely affordable and likely one of the cheapest ways for someone to get into the wind turbine scene. This, of course, comes at the cost of a very small and not very powerful unit but for those after something simple to power a small electronic device it makes much more economic sense than spending multiple factors higher for something that would be overkill. We really like the unique and refreshing approach that Pacific Sky Power did with their tiny wind turbine. While the applications are limited to small devices, the power output given its size and price is surprisingly good and the build quality is acceptable as well. These certainly won’t be for everybody but anybody who wants to dip their toes in a wind turbine for very cheap or don’t need a lot of power then consider trying one of these out. While there are units out there that advertise as having higher overall power capabilities, Primus Wind Power turbines try to stand out by offering a consistent and efficient level of power without the need for extremely high wind speeds. This can be vital in situations where you need steady power and where having a lapse in power production could result in important electronics not properly working. This is achieved through a combination of extremely lightweight and optimized blades as well as advanced microprocessor technology that makes the most out of even small levels of wind. This all combines for an excellent product for those who don’t have constant 25 mph gusts of the wind to work with. These products are designed to be essentially run and forget. Rather than having to constantly fumble with fine-tuning direction and orientation to take advantage of the maximum wind gusts, Primus Wind Power wind turbines instead can thrive in lower-wind environments which take a lot of the strain out of setup and calibration. The fact that they are very lightweight also means that they are easier to transport when necessary. Other helpful features such as the smart controller dynamically alter blade rotation speed so you don’t have to worry about fumbling around with it to try to stop buzzing noises. We are impressed with the build quality in all of their products. While they are lightweight, the materials that are used are of high quality and seem to hold up to typical wear and tear. This is particularly important as many of Primus Wind Power’s wind turbines are designed for marine environments where they will be exposed to much more challenging environments involving salt water, sand, and more volatile wind gusts. In addition, the computer onboard as well as the rotating parts are of quality construction and don’t seem to struggle with proper operation, even long-term. This is clearly reflected in Primus’ impressive 5-year warranty. This great package doesn’t come cheap. Expect to pay well into the premium price range to enjoy one of these units. However, for the unique applications that these wind turbines are capable of handling as well as their more efficient operation, you will end up saving money long term in energy costs since you are able to tap more power from less wind. Primus Wind Power wind turbines are of great quality and performance across the board. Their refreshing approach of not trying to advertise huge, rarely achievable power numbers and instead opting for more realistic numbers based on lower and consistent wind speeds makes them stand out from a lot of the competition. These turbines are easy to use and set up and also are of high enough quality that they should stand up to typical wear and tear, even in challenging marine environments. The higher than average price tag is more than justified here and anybody who tries out one of these units should come out being quite impressed. Wind performance is rather disappointing here. At the maximum wind settings, you are only going to receive up to 400W which is in the middle to low end of the spectrum compared to what else is out there. In addition, the start-up wind speed seems to be between 7 and 8 mph but it barely rotates at this speed, resulting in a little conversion of power. This means that you really need to aim for higher, consistent wind speed to see any significant power output. This is rather surprising as this unit is on the smaller and lightweight side and these types of wind turbines seem to fare better at low and variable wind speeds in our experience. Installation and transportation are simple due to the compact size and shape. Sunforce has also fully weatherproofed their design making it suitable for a wide range of conditions. The tower kit that it is designed around come in at 30 feet tall which can mean you may need to work harder to find a suitable location but the modular design between the turbine and the tower kit is a welcome surprise that we wish more other brands would implement rather than simply making resort to a custom base. There are several noticeable issues with the build quality. While Sunforce wind turbines do offer an impressive 3-year warranty, there are many published and vocal complaints about key components failing early on. Many of these issues revolve around the control board and the turbines themselves. The control boards have been known to fry after less than a year. We suspect this might have to do with them being exposed to elements, particularly water. In addition, the turbines are prone to cracking and chipping. This is despite them being made of carbon fiber. We feel that the lightweight aluminum that is used for the structure might be better off being beefed up some even if it results in slightly higher overall weight. The price isn’t terrible but for the performance, you get it isn’t really that impressive. This likely has to do with the Sunforce name being tagged here but we just don’t see a lot of their quality from their solar units transitioning over here. Sunforce wind turbine misses the mark in several areas. There is only one to choose from and, even at optimal settings, simply doesn’t put off enough power to accomplish much. In addition, it will be rare if you ever experience this power for very long and the output at low wind speeds leaves a lot to be desired. 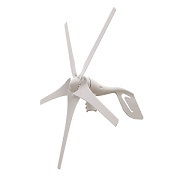 Quality issues revolving around the blades and chipboard add to the many reasons why we think you should shop around some before considering a Sunforce wind turbine. Performance is about what you would expect for such a small and low-cost wind turbine. The maximum posted power output is 400W but you will rarely if ever, experience this level of power output due to a combination of very high wind requirements as well as relatively high inefficiencies in converting the wind to usable power. We do like the low minimum wind speed to produce power, however. It comes in at around 5.5 mph which is much lower than what most other brands can offer. That being said, don’t expect much power to be converted at such low velocities. This is a very simple and compact wind turbine and even come with the energy converter build into the system. This means that it is essentially a plug and play setup which allows you to get started quickly. 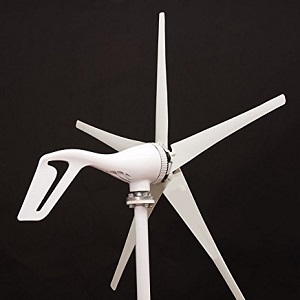 However, it is important to note that this doesn’t come with an elaborate stand that is very tall and many people will prefer to place the turbine up at a higher altitude in order to take advantage of more wind. If you happen to be one of those people keep in mind that you will need to put forth noticeably more effort in order to fulfill this requirement. Build quality isn’t terrible but for this price, we can’t be too picky. Where many other brands might utilize higher end metals or carbon fiber, TOPQSC uses plastic instead. That plastic is of acceptable quality and thickness but simply won’t be able to keep up with the long-term demands like many more expensive materials may. That being said, it appears to do a good job of protecting the internal electrical parts even after a few years. Easily the brightest point of TOPQSC wind turbines is in the very attractive asking price. 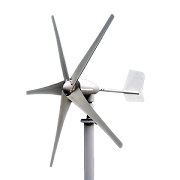 These are among some of the most affordable wind turbines you will come across. Sure, they don’t put out a lot of power and many of the features and expensive materials common in some other brands aren’t present, but this is a great entry point for someone on a tight budget and simply wanting to experiment with a wind turbine for the first time. TOPQSC gives us a single wind turbine that is on the lower end of the spectrum with only 400W of hypothetical power possible. In reality, you will see much less than this most of the time due to the relatively small turbines as well as less efficient internal mechanisms. You will also find a lot more plastic where other brands might use metal. However, overall for the great asking price, we can’t be too picky and for someone on a very strict budget, this may be the only option that they can afford. Performance is lackluster at best. The blades used are on the smaller side and the generators inside are of low quality and can’t handle high power loads. This translates into some of the lowest rating power of any wind turbines on the market. You can expect between 100W and 400W of potential power, with most Toyoso wind turbines leaning towards the lower end of this spectrum. The blades are also a bit bulky compared to their small stature so you will need higher wind speeds than expected for a given power range. These units come in a sort of all-in-one package, although the stands are a bit too short for our liking. When dealing with small blades like these have, maximizing elevation/wind velocity is very important and unfortunately is lacking here. Other than the small stands, the unit is essentially a plug and play which makes it simple to set up. These are extreme budget wind turbines so the build quality is nothing amazing. Plastic is used in places where we would prefer low weight metal and fiberglass is used in areas we like to see carbon fiber. This all translates to a product that won’t be able to handle typical wear and tear nearly as long as more expensive competition that can afford to utilize better materials. Sourcing replacement parts can also be quite a challenge as Toyoso seems to be somewhat tough to work with from a customer service standpoint. We must admit that Toyoso wind turbines are extremely affordable. They will be among the most low-cost options out there but this does mean you have to deal with lackluster power production and questionable quality. Still, for someone who doesn’t want to spend much, it may still be an attractive product. Toyoso wind turbines are a perfect example of what happens when you focus on simplicity and low costs over performance and durability. While the units aren’t inherently bad, they do have some major weak points that may turn them off of many people’s radars. Low power production and cheaper materials are par for the course of ultra-budget turbines and Toyoso sticks to the recipe in their small lineup. We are really impressed with the power across the board with the Tumo-Int wind turbines. At a maximum wind speed of around 29 mph, you can expect up to 5,000W of power in the larger unit and 1,000W in the smaller. This is a huge number and large enough to power a whole range of products and appliances with ease. While most people can’t expect to see a constant and consistent 29mph wind gust, lower speeds also translate over quite well thanks to high efficiency in their converter. No matter what wind speed you focus on, you will get to enjoy some of the most efficient power levels of any wind turbine on the market. That being said, these are rather large models so low wind speeds will result in essentially no power, however. But at around 12 mph, things really start to pick up. The 3 and 5-blade configurations are also a nice touch and depending on where your average wind speed sets, one configuration might be optimal to the other. This is a premium wind turbine so initial set up is a bit more laborious. Everything is larger here so even simple acts such as storage and finding a place to stand it will require a bit more thought. The multi-blade configuration, while a helpful touch, also means that fine-tuning will require a bit more work. However, it is well worth it for the end result. The low-vibration components also mean that small tweaks and calibrations to chase out these vibrations aren’t nearly as common. This unit really is a “set it and forget it” type of product. The build quality is good in every component. The only somewhat weak point is in the blades themselves. For their size and the fact that you may be adjusting them some, we wish that Tumo-Int would have gone with a premium carbon fiber material. But this would have significantly increased the already high asking price so we understand their inhibition in doing so. The rest of the turbine is rock-solid and you can tell that a lot of thought went into design and assembly as vibrations are at a minimum. This means that this unit should last for years without any major concern for breaking down in normal weather conditions. We aren’t surprised to see the high asking price here given the impressive power capabilities and quality construction. However, for many, it may be simply too much to pay and they will have to opt for something with less power but that is also within their price range. That being said, for the “power per dollar” ratio, Tumo-Int wind turbines are extremely competitive and will be great for those looking to bump their wind turbine game up a notch. We are really impressed with what Tumo-Int offers here. Not only is the power production among the top in the industry but the build quality is more than adequate. The fact that it comes in interchangeable 3 and 5-blade models really shows that this company put a lot of thought and engineering into their product. Yes, it is expensive, but the efficiency is among the best out there so we see no problem in saving up a bit more to enjoy a truly great example of a wind turbine. These are relatively lightweight units so power production does start at less than 5 mph which is better than average. The turbine blades are also a bit larger than average from what we have seen which definitely helps. Total power output really depends on which unit you go with but with the choice of up to 700W, there are choices to meet most people’s needs. The only people who will be out of luck are those looking for extremely powerful industrial or commercial-grade units with power production in the 4 figures. Efficiency is about average for a given wind speed but is not bad at all considering the relatively low asking price. All the features we like to see are present including tip stall protection, over speed protection, and an electromagnetic brake. The unit itself is also light enough to be able to be somewhat portable. Really our only complaint is that you will likely have to get a bit creative with the stand in order to elevate it to a point where it can tap into its full potential but this is a common issue with many of the budget models on the market. You won’t find any of the exotic materials common on more expensive units here. For instance, instead of utilizing carbon fiber turbine blades you will be using nylon fiber instead. And the metal of choice here is aluminum which handles corrosion issues just fine but is more susceptible to flexing and bending over time. That being said, Vogvivo stands behind its product and proudly exclaims that the materials used should last up to 15 years with typical wear and tear. You will likely have to deal with electrical issues way before that 15 year time period is up. Considering the solid product you get in regards to performance and build construction, the asking price here is very reasonable. In fact, on a strict power to dollar ratio, Vogvivo wind turbines are among some of the most affordable units out there. There is a noticeable price difference between their entry-level 100W units and their much more powerful 500-700W examples but this is to be expected and all are still very competitive compared to similar products on the market. 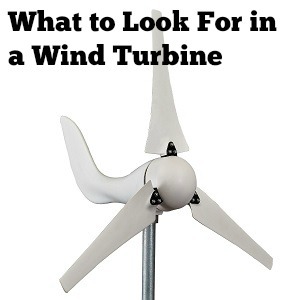 Before you start your search for the perfect wind turbine, it is important to figure out what exactly you are looking for. There are so many different types of wind turbines that simply going in blindly will quickly overwhelm and potentially frustrate you. We encourage you to go over this list of important considerations to help you pinpoint the exact wind turbine you are looking for. One of the biggest factors that come into play is the power output that a wind turbine can produce. After talking to many people, we have noticed that there seems to be a bit of a misunderstanding with how much power a wind turbine actually produces as well as its consistency. In general, people assume that wind turbines produce more power than they actually do. They will see a large turbine with 4 foot long blades and assume that it is easily powering an entire house or building. Unfortunately, that typically is not the case. Most consumer-grade wind turbines will produce between 100W and 3,000W. There are obviously some exceptions on both ends of the spectrum but that is, for the most part, the norm. You can look at various appliances to get a rough idea of how many watts they require to operate. You typical washing machine, for instance, will need between 400 and 1,300 watts to operate. As you can see, the available power in larger wind turbines can quickly be consumed by just a few items. The other thing to consider is that the power output will vary depending on wind speed. Most companies will post their max theoretical wind speed as the power rating. But unless you live in an extremely windy area, you will rarely see maximum power. In addition, wind speed is constantly varying in speed and direction so your power produced will fluctuate quite a bit. It is important to take this into consideration when trying to figure out how many or what size of wind turbines you need for a particular application. 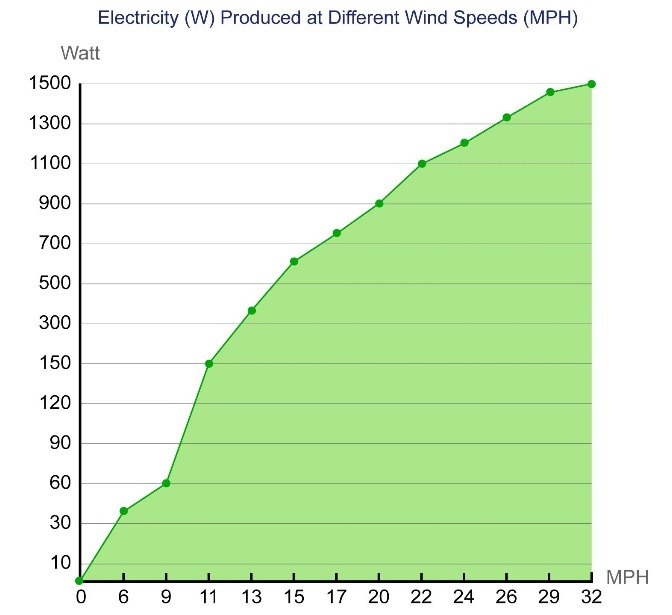 Below is a typical power vs. wind speed graph of a wind turbine (this one is from the Windmill 1500W 24V model). As you can clearly see, winds have to be pretty strong to really see significant power conversion. At a wind speed of 10 mph, for example, you will only be seeing around 75W of power. The other factor that comes into play is voltage and amps. Different wind turbines will output their power in different volts/amps. The most common voltages are 12, 24, 36, 48, 72, and 120. There are converters that can alter this if necessary but you will likely have to purchase this separately. Another consideration is in the orientation or direction of the wind turbine. There are two popular types: horizontal and vertical. Horizontal is by far the most typical. This is where the blades axis is parallel to the ground or in a horizontal direction. Horizontal is by far the most typical. This is where the blades axis is parallel to the ground or in a horizontal direction. Vertical is less common but still a popular wind turbine setup. This is where the blade’s axis points perpendicular to the ground or in a vertical direction. Vertical and Horizontal wind turbines both come with their own unique pros and cons. We break down both below. Horizontal wind turbines perform much better in heavier wind settings and typically can produce much higher levels of electricity. This is why if you drive past a wind farm you will almost exclusively see horizontal wind turbines. However, they tend to struggle in lower winds and also winds that vary greatly in intensity in direction. This is mostly attributed to the fact that they are typically much larger and heavier than vertical wind turbines (which also makes them take up more space as well as be more challenging to transport and install). Vertical wind turbines are far less common but do have their place. They are much better in settings with lower wind speeds as well as the wind that is more sporadic in direction and intensity. This is because they are typically much more lightweight and also can be powered by wind coming from all 360 degrees. This makes them good for residential applications where installing a tall and massive horizontal wind turbine is simply not feasible. However, they tend to produce much lower power levels and they are also much more expensive for a given power rating. Wind turbines can also vary in the number of blades. That being said, a vast majority of them will have 3 blades. The reason behind this is that 3 blade wind turbines have an infinite number of principal axes while also providing relatively low wake. Wake is basically disturbed air around the blade from a previous rotation. This directly affects performance. Theoretically, a single blade turbine would be the most efficient, but you run into structural and support issues since the mechanism aren’t well balanced. So why are their wind turbines with 5 or more blades? There has been research that shows that higher numbers of blades can actually be better on smaller turbines. They may see slight improvements in efficiency and startup speed may also be improved due by manipulating the tip speed ratio. If you would like to read more into the technical details we recommend checking out this interesting discussion on the matter. But for the sake of simplicity, we recommend sticking with a 3-blade setup most of the time. Many people confuse wind turbines with windmills. And others can easily identify a windmill from a wind turbine but when it comes to each one’s purpose we often times see blank stares. While they perform similarly, their applications and principles of functionality vary quite a bit. We will go over each and show how they are different and what types of jobs each is intended to be used for. Windmills have been around for thousands of years, far before modern-day electricity. I’m sure many of you have seen an old windmill in person. They are typically made of wood or low-quality metal and will have many blades. The purpose of a windmill is to do work as opposed to produce electricity. Examples of applications for windmills include pumping water, running a grain grinder, or assisting in various farm animal tasks. The large and slow blades that exist on windmills are rotated by the wind which converts linear momentum to rotational momentum. This rotational energy is then used to mechanically power gears or shafts that perform work. This work is real-time and it is not stored in a battery or other device. In addition, the amount of work possible is directly related to the wind speed at the time of application. If wind speeds are slow, the gears won’t spin as fast and, depending on what you are trying to do, you may be out of luck. Wind turbines are used to produce electricity rather than perform direct work. The blades are attached to a shaft that is then connected to a generator of some kind. When the shaft spins it produces electricity via the generator. Energy.gov has a great article that goes into more detail about how this works. This electricity can be stored and/or used for any sort of application that requires electricity. So rather than simply performing mechanical work, wind turbines are converting potential energy in wind into usable electricity. They also take advantage of different physical principles to operate. While windmills simply convert linear momentum of wind into rotational momentum, wind turbines actually utilize lift and drag (similar to an airplane wing) to help spin the blades. This principle, as well as much lighter and smaller blades, mean that most wind turbines will spin much faster than a typical windmill.